INDIA Parliament capitulated to Anna Hazare's demands on an anticorruption measure. MADRID — Hundreds of thousands of disillusioned Indians cheer a rural activist on a hunger strike. Israel reels before the largest street demonstrations in its history. Enraged young people in Spain and Greece take over public squares across their countries. GREECE A protest in front of the Finance Ministry. Parliament passed a property-tax law Tuesday. Economics have been one driving force, with growing income inequality, high unemployment and recession-driven cuts in social spending breeding widespread malaise. Alienation runs especially deep in Europe, with boycotts and strikes that, in London and Athens, erupted into violence. But even in India and Israel, where growth remains robust, protesters say they so distrust their country’s political class and its pandering to established interest groups that they feel only an assault on the system itself can bring about real change. Young Israeli organizers repeatedly turned out gigantic crowds insisting that their political leaders, regardless of party, had been so thoroughly captured by security concerns, ultra-Orthodox groups and other special interests that they could no longer respond to the country’s middle class. 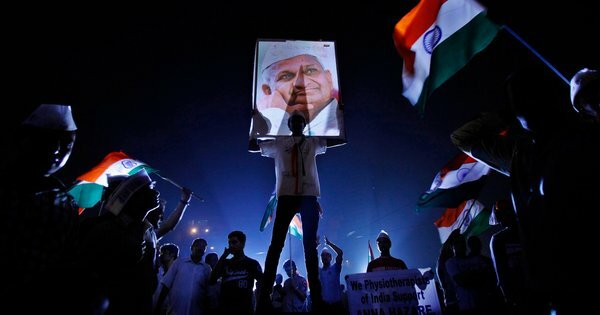 In the world’s largest democracy, Anna Hazare, an activist, starved himself publicly for 12 days until the Indian Parliament capitulated to some of his central demands on a proposed anticorruption measure to hold public officials accountable. “We elect the people’s representatives so they can solve our problems,” said Sarita Singh, 25, among the thousands who gathered each day at Ramlila Maidan, where monsoon rains turned the grounds to mud but protesters waved Indian flags and sang patriotic songs. Yonatan Levi, 26, called the tent cities that sprang up in Israel “a beautiful anarchy.” There were leaderless discussion circles like Internet chat rooms, governed, he said, by “emoticon” hand gestures like crossed forearms to signal disagreement with the latest speaker, hands held up and wiggling in the air for agreement — the same hand signs used in public assemblies in Spain. There were free lessons and food, based on the Internet conviction that everything should be available without charge. The rising disillusionment comes 20 years after what was celebrated as democratic capitalism’s final victory over communism and dictatorship. In the wake of the Soviet Union’s collapse in 1991, a consensus emerged that liberal economics combined with democratic institutions represented the only path forward. That consensus, championed by scholars like Francis Fukuyama in his book “The End of History and the Last Man,” has been shaken if not broken by a seemingly endless succession of crises — the Asian financial collapse of 1997, the Internet bubble that burst in 2000, the subprime crisis of 2007-8 and the continuing European and American debt crisis — and the seeming inability of policy makers to deal with them or cushion their people from the shocks. Frustrated voters are not agitating for a dictator to take over. But they say they do not know where to turn at a time when political choices of the cold war era seem hollow. “Even when capitalism fell into its worst crisis since the 1920s there was no viable alternative vision,” said the British left-wing author Owen Jones. Protests in Britain exploded into lawlessness last month. Rampaging youths smashed store windows and set fires in London and beyond, using communication systems like BlackBerry Messenger to evade the police. They had savvy and technology, Mr. Jones said, but lacked a belief that the political system represented their interests. They also lacked hope. SPAIN The weekly general assembly of the protest movement in Madrid's Puerta del Sol. Spain's unemployment rate is 21 percent. “The young people who took part in the riots didn’t feel they had a future to risk,” he said. In Spain, walloped by the developed world’s highest official rate of unemployment, at 21 percent, many have lost the confidence that politicians of any party can find a solution. Their demands are vague, but their cry for help is plaintive and determined. Known as indignados or the outraged, they block traffic, occupy squares and gather for teach-ins. Ms. Solanas, an unemployed online journalist, was part of the core group of protesters who in May occupied the Puerta del Sol, a public square in Madrid, the capital, touching off a nationwide protest. That night she and some friends started the Twitter account @acampadasol, or “Camp Sol,” which now has nearly 70,000 followers. While the Spanish and Israeli demonstrations were peaceful, critics have raised concerns over the urge to bypass representative institutions. In India, Mr. Hazare’s crusade to “fast unto death” unless Parliament enacted his anticorruption law struck some supporters as self-sacrifice. Many opponents viewed his tactics as undemocratic blackmail. Hundreds of thousands of people turned out last month in New Delhi to vent a visceral outrage at the state of Indian politics. One banner read, “If your blood is not boiling now, then your blood is not blood!” The campaign by Mr. Hazare, 74, was intended to force Parliament to consider his anticorruption legislation instead of a weaker alternative put forth by the government. Parliament unanimously passed a resolution endorsing central pieces of his proposal, and lawmakers are expected to approve an anticorruption measure in the next session. Mr. Hazare’s anticorruption campaign tapped a deep chord with the public precisely because he was not a politician. Many voters feel that Indian democracy, and in particular the major parties, the Congress Party and the Bharatiya Janata Party, have become unresponsive and captive to interest groups. For almost a year, India’s news media and government auditors have exposed tawdry government scandals involving billions of dollars in graft. Responding to shifts in voter needs is supposed to be democracy’s strength. These emerging movements, like many in the past, could end up being absorbed by traditional political parties, just as the Republican Party in the United States is seeking to benefit from the anti-establishment sentiment of Tea Party loyalists. Yet purists involved in many of the movements say they intend to avoid the old political channels. The entrenched political players of the post-cold-war old guard are struggling. In Japan, six prime ministers have stepped down in five years, as political paralysis deepens. The two major parties in Germany, the Christian Democrats and the Social Democrats, have seen tremendous declines in membership as the Greens have made major gains, while Chancellor Angela Merkel has watched her authority erode over unpopular bailouts. In many European countries the disappointment is twofold: in heavily indebted federal governments pulling back from social spending and in a European Union viewed as distant and undemocratic. Europeans leaders have dictated harsh austerity measures in the name of stability for the euro, the region’s common currency, rubber-stamped by captive and corrupt national politicians, protesters say. Unlike struggling Europe, Israel’s economy is a story of unusual success. It has grown from a sluggish state-dominated system to a market-driven high-tech powerhouse. But with wealth has come inequality. The protest organizers say the same small class of people who profited from government privatizations also dominates the major political parties. The rest of the country has bowed out of politics. Mr. Levi, born on Degania, Israel’s first kibbutz, said the protests were not acts of anger but of reclamation, of a society hijacked by a class known in Hebrew as “hon veshilton,” meaning a nexus of money and politics. The rise of market forces produced a sense of public disengagement, he said, a feeling that the job of a citizen was limited to occasional trips to the polling places to vote. Ethan Bronner contributed reporting from Tel Aviv, and Jim Yardley from New Delhi.